Source: Rev. John Mason Neale and Rev. Thomas Helmore, eds., Hymnal Noted, Part I. (London: Novello & Co., 1852), Part II (London: Novello & Co., 1856), #11 (#29 in Combined Edition), p. 35. Rom. xiii. 11—" Now it is high time to awake out of sleep : for now is our salvation nearer than when we believed." Rev. John Mason Neale and Rev. Thomas Helmore, eds., Hymnal Noted, Part I. (London: Novello & Co., 1852), Part II (London: Novello & Co., 1856), #11 (#29 in Combined Edition), p. 35. Sheet Music from Thomas Helmore, Accompanying Harmonies to the Hymnal Noted. Part I (London: Novello, Ewer and Co., and Masters and Son, 1852), Part II (London: Novello and Co., Joseph Masters and J. T. Hayes, 1858), #11, Verbum supernum prodiens. Rev. Matthew Britt, O.S.B., in his Hymns from the Breviary and Missal (London: Burns Oates & Washbourne Ltd., 1922), pp. 97-98, noted that there were about thirty translations, four of which are in the Annus Sanctus. Liturgical Use: Hymn for Matins on Sundays and week-days during Advent. 1. Supernal Word, Proceeding From. From Verses on Various Occasions, 1868. John Henry, Cardinal Newman. 1834-1842. 2. O Thou, Who Thine Own Father's Breast. From Hymns and Poems, 1873. Father Edward Caswall, Birmingham Oratory, 1848. 3. Supernal Word, Who Didst Proceed. John Charles Earle, 1883. 4. The Period Is Come, And Lo, To-day. Primer, 1706. (Probably) John Dryden. The Editor of Annus Sanctus, Mr. Shipley, describes this as a "Gregorian Matins Breviary Hymn." Note from Dr. John Julian, Dictionary of Hymnology (1892), pp. 1217-1218. Verbum Supernum prodiens, A Patre olim exiens. [Advent.] 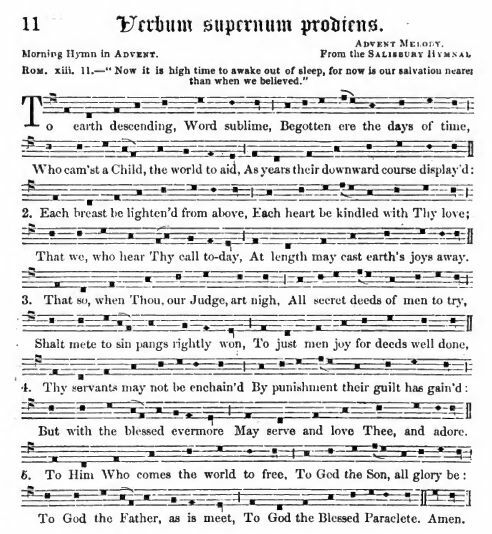 This hymn, a short and good summary of the leading ideas of Advent, is given as No. 33 in Mone, with the remark that it is probably of the second half of the 5th cent. Daniel gives the text at i. No. 74, and at iv. p. 144 cites it as in a Rheinan MS. of the 11th cent., ranking it as a hymn of the 11th cent. Among the British Museum MSS. it is found in three 11th cent. Hymnaries of the English Church (Vesp. D. xii. f. 29; Jul. A. vi. f. 31b; Harl. 2961, f. 225b); in an 11th cent. Mozarabic Hymnarium (Add. 30851, f. 112); an 11th cent. Mozarabic Breviary (Add. 30848, f. 3), &c. It is in G. M. Dreves's Hymn. Moissiacensis, 1888, from a 10th cent. MS. ; in a MS. of the 11th cent, at Corpus Christi, Cambridge (391, p. 239); in a MS. of the 11th cent, at St. Gall, No. 413; and in the Latin Hymns of the Anglo-Saxon Church. (Surtees Society), 1851, is printed from an 11th cent. MS. at Durham (B. iii. 32, f. 11). It is included in the older Roman (Venice, 1478), Sarum, York, Aberdeen, and other Breviaries, the Sarum use being at Matins on the 1st Sunday in Advent, and daily up to Christmas Eve. The text is also in Wackernagel, i. No. 55; the Hymnarium Sarisb., 1851, p. 4; L. C. Biggs's annotated Hymns Ancient & Modern, 1867, &c.
1. To Earth Descending, Word Sublime. By J. M. Neale, in the Hymnal Noted, 1852, No. 11, the Hymner, 1882, &c.
2. O Word Supreme, created not. By R. F. Littledale, in the People's Hymnal, 1867. 1. Word from the Sire, supernal. W. J. Blew. 1852-55. 2. Supernal Word! Thou Effluence bright. J. D. Chambers, 1852 and 1857. 3. Word of the Father, Coming from high. J. W. Hewett, 1850.
ii. The Roman Breviary Text. 1. Word of th' eternal Father's might. By W. J. Copeland, in his Hymns for the Week, 1848, p. 55. 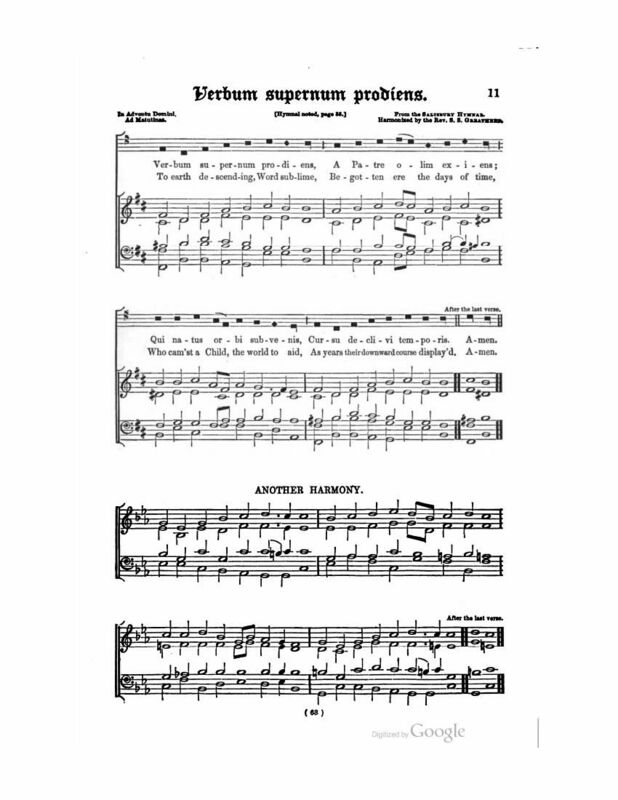 In Murray's Hymnal, 1852, it is given in an altered form. 2. O Thou, Who Thine Own Father's Breast. 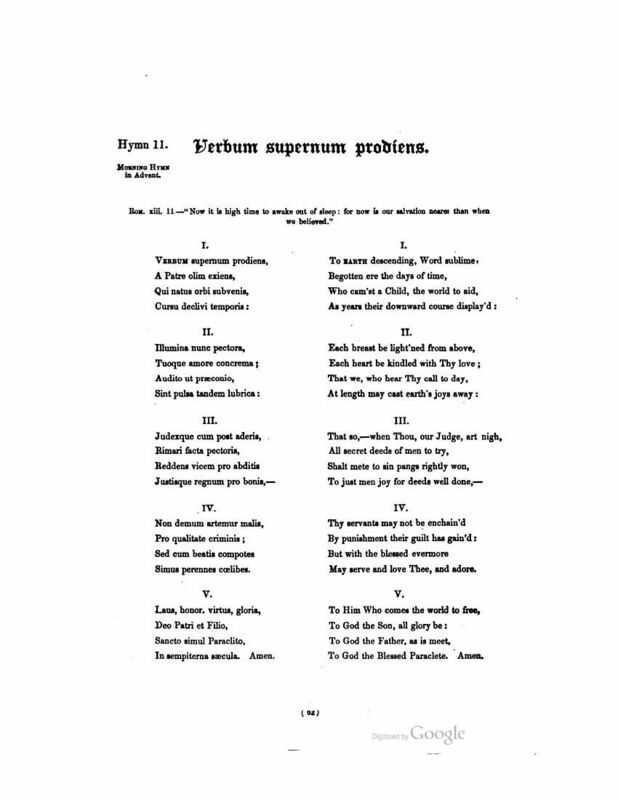 By E. Caswall, in his Lyra Catholica, 1849, p. 45, and his Hymns and Poems, 1873, p. 25. It is repeated in a few modern collections, sometimes as "Eternal Word, Who dost reside," as in the English Hymnal, 1852-61, where it is changed from C.M. to L.M. ; and again as "Thou Who didst leave Thy Father's breast." 3. Supernal Word, Proceeding From. By Cardinal Newman, in his Verses on Religious Subjects, 1853, p. 108, and his Verses on Various Occasions, 1868, p. 255. This is repeated in the Hymnary, 1872, and others. 4. O Heavenly Word, Eternal Light. By the Compilers of Hymns Ancient & Modern. It was given in the trial copy of that collection in 1859 [Hymns], the 1st ed., 1861, and the revised ed., 1875. It is also in other hymn-books. The first stanza is based upon Copeland's translation as above. 5. O Word celestial, Who Thy rest. By R. C. Singleton, in his Anglican Hymn Book, 1868. 1. The Period Is Come, And Lo, To-day. Primer, 1706. 2. Eternal Word, Who dost proceed. Bp. G. W. Doane. 1834. 3. Word uncreate, beloved one. Bp. R. Mant. 1837. 4. Thy Father's Bosom Thou Didst Leave. J. Chandler. 1837. 5. Dread Word, Who erst, when time was not. Hymnarium Anglicanum, 1844. 6. O gracious Word, that issuing forth from Heav'n. W. Palmer. 1845. 7. Lo the Word from God proceedeth. W. Bright. 1858. 8. O Thou, the Word, Supreme and blest. F. Trappes. 1865. 9. Dread Word, Who from the Father hast. J. Keble, in his Misc. Poems. 1869. 10. O Word, proceeding from Thy home. J. Wallace. 1874.